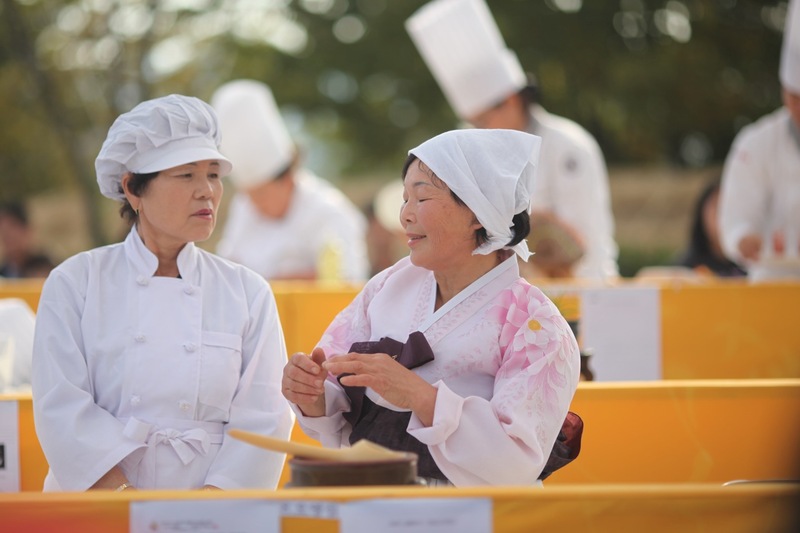 It’s often been mentioned to me that when it comes to Korean culinary delights Jeollanamdo is the best province in Korea, so this year I resolved to visit the Namdo food festival taking place at Nagan folk village. This was a chance I thought to savour some flavours all in the confines of the picturesque Nagan folk village. I think before I went I had visions of market stalls and lots of food you could sample for free, so I was in for a disappointment when this failed to be there. I’d have to say the festival side of things left me distinctly underwhelmed. It’s true that all the charm of the village was still there, but I’ve seen this on more than one occasion now and wanted more. What they did have there was the chance to see several Korean chefs complete with each other to make a regional specialty, and afterwards a chance for the general public to eat some of the creations. Also there were restaurants scattered around the village each with a name of a town in Jeollanamdo complete with that towns local specialty, now that’s where I’m really looking to see a few free food samples. The festival also had the obligatory stage with a few trout old timers from yesteryear belting out the songs they no doubt sang the year before and the year before that (Ok this might be generalising a tad). In case anyone doesn’t know trout it’s basically Dad rock and usually makes my students laugh when it gets mentioned. At a food festival you’re looking for nicely displayed food, and this was there as well, but we had to wait in line for the chance to see the cling film covered works of food art. The day was saved by the village itself, which never fails to disappoint. I was even given some free crockery by a Korean man who was impressed with my crystal ball photography! This entry was posted in Uncategorized and tagged Folk, Food Festival, Jeollanamdo, Korea, Nagan, Suncheon, Village. Bookmark the permalink.